Many of my readers have reported some of the following symptoms: brittle or white-spotted nails, a tendency to get sick easily, allergies, frequent respiratory infections, an impaired sense of taste and smell, diarrhea, hair loss, impotence, loss of appetite, skin issues, depression, and impaired vision. Are you one of them? Figuring out the root causes of your Hashimoto’s-related symptoms can be challenging and overwhelming. After all, many symptoms overlap with several other conditions. But, the origin of these symptoms doesn’t have to be a mystery. Often, these symptoms stem from a deficiency in an essential trace element: zinc. One in four individuals in the general population may be zinc deficient, including most people with hypothyroidism and Hashimoto’s. Furthermore, an estimated 17 percent of the worldwide population is at risk of inadequate zinc intake. Zinc is involved as a catalyst in many different pathways in the body. It’s also very important for gut health, immune function, tissue healing, the conversion of T4 to T3, and the production of TSH. It can help tighten the intestinal junctions of those with intestinal permeability as well. For this reason, increasing your zinc levels may help reduce your symptoms and even lead you towards remission! What are the symptoms and causes of zinc deficiency? 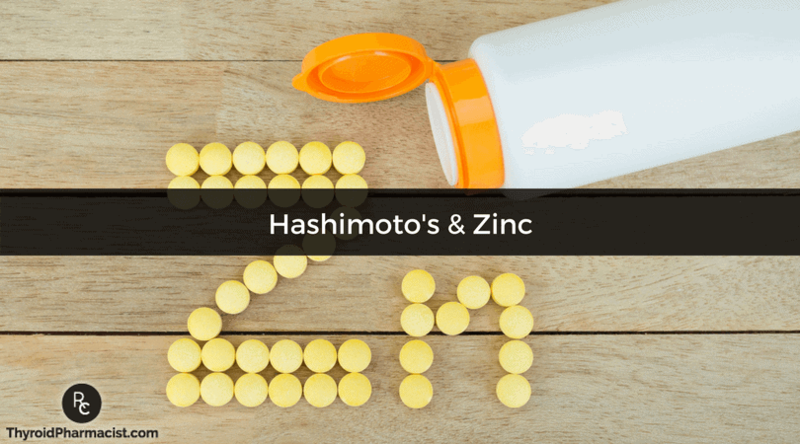 How do low zinc levels affect Hashimoto’s? Can addressing zinc deficiency help social anxiety? Zinc is considered an essential trace element, which means that small amounts are important to our well-being. After all, it acts as a catalyst in about a hundred different enzyme reactions required by our body, and is involved in DNA synthesis, immune function, protein synthesis, and cell division. Adequate levels of zinc are required for proper sense of taste and smell, detoxification, and wound healing. Zinc also plays a specific role in gut health. In fact, zinc deficiency has been associated with increased intestinal permeability and susceptibility to infections, which are common triggers of Hashimoto’s, as well as reduced detoxification of bacterial toxins. Replenishing zinc has been shown to help to tighten the intestinal walls and repair intestinal permeability in other conditions such as Crohn’s disease. In addition, zinc helps to prevent oxidative stress, which could otherwise knock your body’s antioxidant levels out of balance and damage your DNA. Zinc is also an essential element for thyroid function. A depletion in zinc prevents the conversion of the T4 hormone into the active T3 version. This could lead to symptoms like hair loss, fatigue, and weight gain, even while taking thyroid medications like Synthroid. You can read more about the effects of insufficient T3 levels here. Zinc is also needed to form TSH, which is why those with hypothyroidism and who are constantly producing TSH are more likely to develop deficiencies in this important mineral. When taken with selenium, (another nutrient that has been proven to be beneficial for those with Hashimoto’s), zinc has been shown to improve thyroid function. In 2015, a study was conducted with 68 overweight or obese female hypothyroid patients who received either a zinc supplement, a selenium supplement, placebo pills, or both zinc and selenium supplements taken together. Three months later, it was noted that those taking both zinc and selenium, as well as those just taking zinc supplements, saw a significant increase in their free T3 levels. Those taking both zinc and selenium experienced a significant decrease in their TSH and an increase in T4 levels. The study concluded that zinc, when taken alone as well as in combination with selenium, can have a positive effect on thyroid function in overweight or obese patients with hypothyroidism. The benefits of zinc supplementation in thyroid patients were also confirmed when I surveyed over 2000 of my readers and asked them what interventions worked for them. Fifty-two percent of them said taking a daily dose of 30mg of zinc made them feel better. Furthermore, 58 percent said they saw an improvement in energy, 48 percent in their mood, 30 percent in their lab results, and 25 percent in skin changes. Symptoms of zinc deficiency can include poor wound healing, impaired taste and smell, and thin, brittle, peeling, or white-spotted nails. Those low in zinc may also have a weakened immune system and suffer from allergies or frequent colds and respiratory infections. Furthermore, depleted zinc levels can result in diarrhea, hair loss, impotence, loss of appetite, skin issues (acne, rashes, canker sores, foot fungus), depression, impaired vision, low sperm count, ADHD, unexplained weight loss, a lack of alertness, and open sores on the skin. As I mentioned earlier, one in four individuals in the general population may be zinc deficient, and your chances increase if you have hypothyroidism or Hashimoto’s. Interestingly, in 2013, a study involving rats with induced hypothyroidism found that hypothyroidism led to changes in their serum zinc levels, suggesting that hypothyroidism also contributes to lower zinc levels (likely due to impaired digestion). Celiac disease and malabsorption syndromes: The absorption of zinc may be impaired by intestinal damage due to conditions such as celiac disease and other malabsorption syndromes. Phytate-rich foods: Phytates found in grains, legumes, nuts, and seeds can bind zinc and prevent its absorption when they are eaten alongside zinc-containing foods. Iron supplements: Taking iron supplements in conjunction with meals may also prevent the absorption of zinc from food. Low stomach acid: A lack of stomach acid, which is common in those with Hashimoto’s, can prevent one’s absorption of zinc, as well as other nutrients. High cortisol levels or excessive cortisol production: Zinc can become depleted with excessive cortisol production, which is associated with increased levels of stress, as well as adrenal dysfunction. Certain diets: Many diets, including vegan, gluten free, Paleo, low-fat, high-protein, lactose free, low-carb, low-sodium and Standard American Diets, may incorporate less zinc-rich foods. Medications: Certain medications, like synthetic estrogen and progesterone (found in birth control pills, which can rob us of our health), acid blocking medications like proton pump inhibitors (ie. Prilosec, Nexium, Omeprazole and other purple pills), and H2 receptor blockers such as Pepcid or famotidine, can deplete zinc levels. Pyroluria and Social Anxiety: Pyroluria, also known as Mauve Factor or Pyrrole Disorder, is a genetic abnormality in which one produces an unusually high number of hydroxyhemopyrrolin-2-one (HPL) in their body. Pyroluria can cause shyness, introversion, and symptoms related to anxiousness and shyness, including social anxiety. Other classic symptoms include morning nausea or lack of appetite, poor dream recall, strange dreams or nightmares, depression, and a puffy, swollen face. It can be diagnosed by testing for pyrroles present in urine samples.The current scientific literature shows that HPL binds to vitamin B6 and zinc, resulting in the excretion of these nutrients via the urine in large amounts. As such, this condition has been linked to zinc deficiency and a greater need for supplementation. In fact, certified nutritionist Trudy Scott believes addressing zinc along with vitamin B6 deficiencies can prevent pyroluria and social anxiety. You can find out more about pyroluria on her website, as well as in her book The Antianxiety Food Solution. Abnormal Eating Disorders: Research has associated zinc deficiency with reduced food consumption. Studies have suggested that increasing one’s zinc levels may benefit those with anorexia nervosa by correcting abnormalities in gamma-Aminobutyric acid (GABA) neurotransmitters and the amygdala, which are abnormal in anorexic individuals. Its effects on bulimia nervosa have also been reported, but research is scarce. Chronic Fatigue Syndrome: Researchers have found that zinc levels were lower in those with chronic fatigue syndrome. Other studies have shown that zinc can be lowered by the presence of increased levels of pro-inflammatory cytokines such as IL-6. Testing for zinc can be done through a standard blood test ordered by your practitioner. However, it’s important to note that some blood tests may not be accurate, as they do not indicate the level of cellular zinc. Additionally, signs and symptoms of zinc deficiency can be present, despite normal lab results. As such, a liver function blood test may help to identify a zinc deficiency, which will present as low alkaline phosphatase (ALP) levels. (The optimal range for this enzyme is 70 to 90 IU/L). The Comprehensive Metabolic Panel by Ulta Lab Tests can check your alkaline phosphatase levels, as well as other markers related to liver health. Advanced testing for vitamin and mineral deficiencies can also be done to help determine your body’s zinc levels. The SpectraCell Laboratories Micronutrient Test is a great option to consider, as it will check for multiple other nutrient deficiencies as well, including: vitamin A, vitamin B1, vitamin B2, vitamin B3, vitamin B6, vitamin B12, biotin, folate, vitamin C, vitamin D, vitamin K, calcium, magnesium, manganese, copper, selenium, vitamin E, and more! Avoiding the consumption of alcohol, refined sugar, white flour, rice, and oxalate-rich foods, which are zinc-depleting foods, may also help you with zinc extraction. Nonetheless, since zinc is not stored in the body, those with zinc deficiency, Hashimoto’s and other autoimmune conditions may want to consider zinc supplementation as part of their everyday regimen. To address a deficiency in zinc, supplements may be utilized. However, I don’t like recommending one-a-day-type vitamins because they don’t consider how the vitamins interact with one another. For example, vitamin C taken with iron improves the absorption of iron, while iron taken with zinc decreases the absorption of zinc. Thus, providing just the recommended dietary allowance (RDA) of zinc when only 50 percent of it will be absorbed is not effective in overcoming a severe zinc deficiency. Some vitamins and minerals need to be taken with food to promote absorption; others, on an empty stomach. Furthermore, not all supplemental zinc formulations are created equally. I prefer the zinc picolinate version, such as the one made by Pure Encapsulations, because it is absorbed better. I usually recommend doses of no more than 30 mg per day, unless you’re working with a practitioner who advises higher doses. To ensure proper absorption, zinc supplements should be taken with food. I’ve also found that taking 500 mg of evening primrose oil, twice per day, improves the absorption of zinc. Doses should be no more than 30 mg per day without your doctor’s supervision. This is because doses above 40 mg may cause a depletion in copper levels. Zinc supplementation can also deplete one’s iron levels. In fact, in one study, taking 50 mg of zinc taken over ten weeks led to depletions in both copper and iron. In other cases, however, taking too much zinc can produce a copper deficiency, and you may need to take supplemental copper. Symptoms of copper deficiency include anemia not responsive to iron supplementation, trouble with walking and balance, fatigue, and lightheadedness. Please refer to your medical practitioner if you suspect you will need a copper supplement in addition to zinc, or if you may be at risk for abnormal copper levels. Zinc is a vitally important nutrient, playing a key role in over one hundred functions in your body, including proper immune system function, intestinal wall repairs, and tissue healing. It also plays a vital role in TSH production and the conversion of T4 to T3. Depleted zinc levels, which are common in those with Hashimoto’s, can be the root cause of many of your symptoms, including poor wound healing, impaired taste and smell, thin, brittle, peeling, or white-spotted nails, a weakened immune system, allergies, frequent colds and respiratory infections, diarrhea, unexplained weight loss, a lack of alertness, and open sores on the skin. If any of these sound familiar, think about zinc! As many causes of zinc depletion are common co-occuring conditions in those with Hashimoto’s, increasing your zinc levels may help reduce your symptoms and put your autoimmune thyroid condition into remission. While you can absorb zinc from dietary sources, it’s important to remember that zinc is not stored in the body, so I recommend adding a zinc picolinate supplement to your daily regimen to boost and maintain your zinc levels. You may also consider taking it with evening primrose oil for better absorption. Again, if your zinc levels do not improve after starting supplementation, you may wish to consider looking into whether you have copper toxicity. I hope this brings you one step closer to putting together the puzzle pieces of your symptoms. Remember, every effort spent towards optimizing your health is a step towards getting and feeling better. I wish you all the best on your healing journey! P.S. You can also download a free Thyroid Diet Guide, 10 Thyroid friendly recipes, and the Nutrient Depletions and Digestion chapter for free by going to www.thyroidpharmacist.com/gift. You will also receive occasional updates about new research, resources, giveaways and helpful information. For future updates, make sure to follow us on Facebook! Daher R. Consequences of dysthyroidism on the digestive tract and viscera. World Journal of Gastroenterology. 2009;15(23):2834. doi:10.3748/wjg.15.2834. Wada L, King J. Effect of low zinc intakes on basal metabolic rate, thyroid hormones and protein utilization in adult men. The Journal of Nutrition. 1986. Maes M, Mihaylova I, Leunis JC. In chronic fatigue syndrome, the decreased levels of omega-3 poly-unsaturated fatty acids are related to lowered serum zinc and defects in T cell activation. Neuro Endocrinol Lett. 2005 Dec;26(6):745–751. Maes M, Mihaylova I, De Ruyter M. Lower serum zinc in chronic fatigue syndrome (CFS): relationship to immune dysfunctions and relevance for the oxidative stress status in CFS. Journal of Affective Disorders. 2005. El-Tawil AM. Zinc supplementation tightens leaky gut in Crohn’s disease. Inflamm Bowel Dis. Feb 2012;18(2):E399. doi: 10.1002/ ibd.21926. Cui L, et al. Prolonged zinc‐deficient diet alters alkaline phosphatase and disaccharidase activities and induces morphological changes in the intestine of rats.. December 1998;8(4):249–261. Baltaci AK, Mogulkoc R, Belviranti M. Serum levels of calcium, selenium, magnesium, phosphorus, chromium, copper and iron—their relation to zinc in rats with induced hypothyroidism. Act Clin Croat.2013 Jun;52(2):151-6. McClain CJ, et al. 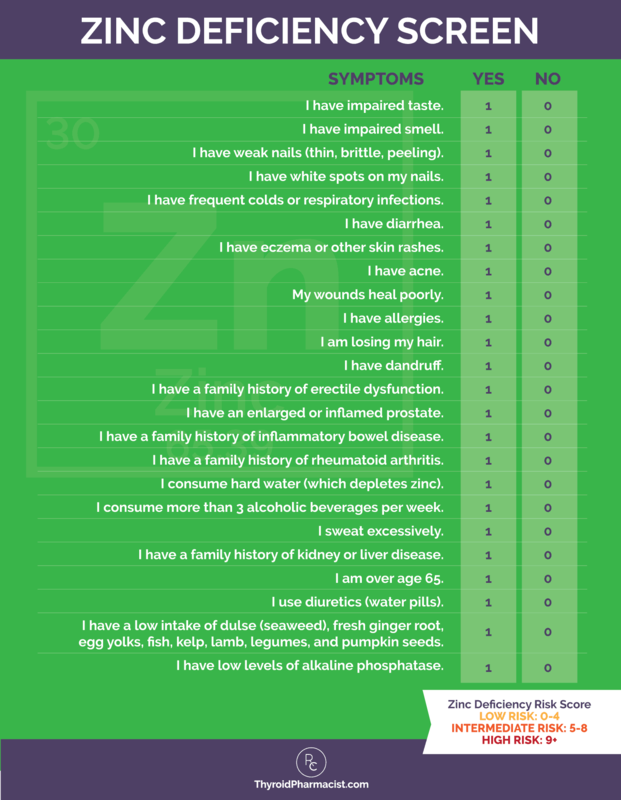 Zinc status before and after zinc supplementation of eating disorder patients. J Am Coll Nutr. Dec 1992;11(6):694–700. Birmingham CL, Gritzner S. How does zinc supplementation benefit anorexia nervosa?. Eat Weight Disord. 2006 Dec;11(4):e109-11. Zef FD, Rao P, Runions K, Stewart RM, Moore JK, Wong JW, et al. Differences in serum zinc levels in acutely ill and remitted adolescents and young adults with bulimia nervosa in comparison with healthy controls – a cross-sectional pilot study. Neuropsychiatr Dis Treat. 2017 Oct;13:2621-2630. doi: 10.2147/NDT.S137549. Mahmoodianfard S, Vafa M, Golgiri F, Khoshniat M, Gohari M, Solati Z, et al. Effects of Zinc and Selenium Supplementation on Thyroid Function in Overweight and Obese Hypothyroid Female Patients: A Randomized Double-Blind Controlled Trial. J Am Coll Nutr. 2015;34(5):391-9. doi: 10.1080/07315724.2014.926161. Sazawal S, Black RE, Jalla S, Mazumdar S, Sinha A, Bhan MK. Zinc supplementation reduces the incidence of acute lower respiratory infections in infants and preschool children: a double-blind, controlled trial. Pediatrics. 1998 Jul;102(1 Pt 1):1-5. Sullivan D. Zinc Deficiency. Healthline. https://www.healthline.com/health/zinc-deficiency#symptoms. Published June 14, 2017. Accessed May 17, 2018. McGinnis WR, Audhya T, Walsh WJ, Jackson JA, McLaren-Howard J, Lewis A, et al. Discerning the Mauve Factor, Part 1. Altern Ther Health Med. 2008 Mar-Apr;14(2):40-50. Scott T, Schuler C. How Zinc and Vitamin B6 Prevent Pyroluria and Social Anxiety. Presented as part of the Anxiety Summit; June 22, 2014. Ames BN. A role for supplements in optimizing health: the metabolic tune-up. Archives of Biochemistry and Biophysics. 2004 Mar;423(1):227-234. https://doi.org/10.1016/j.abb.2003.11.002. For some strange reason my feet started smelling really bad. I changed shoes and washed them every day, still they stunk! I inquired of the Google which told me supplementing with zinc has been known to fix this problem. The thing was I had been supplementing my diet with zinc picolinate for awhile! So I quit and my feet stopped smelling. Don’t know what to make of that! Ann – thank you for sharing! I’ve been trying very very hard to cut out all Gluten but I recently read that it is ok to have glucose syrup – what are your thoughts on this? I have cut this out too as I’m still having issues with aching elbows and knees – and this is the only thing I can think of that is causing this (or it could be potatoes/nightshades). Also, I have tried to cut out all Soy (it seems to be in everything) but then I read that it is ok to have Gluten Free Soy Sauce! I did a urine test for Hashimoto’s which I was told was negative, but I have a goitre and have noticed a huge improvement in changing my diet over the past 6 months. My thyroid levels are in the “ normal range” but my antibodies are high, not crazy high, but elevated some. I’ve been struggling with horrible fatigue and depression and very anxious. My doctor put me on synthroid. 25M, the lowest dose, it made me feel very tired and hungover feeling. My doctor said try a half. . What are your thoughts on this? I find your articles very informative. https://thyroidpharmacist.com/checkout/?product_id=4702 Have you read these articles? There are quite a few options for thyroid medications. In my experience, what works for one person may not work for another. If your doctor will not prescribe the medication which you are looking for, ask your local pharmacist for doctors in your area who prescribe the medication you are looking to try. WHICH THYROID MEDICATION IS BEST?